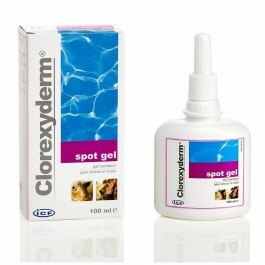 Clorexyderm® Spot Gel is a TrisEDTA / Chlorhexidine Skin Gel for Dogs and Cats. Clorexyderm® Spot Gel is a blue antibacterial, antifungal gel with the capacity to form a moisturising barrier film on the skin. Clorexyderm® Spot Gel is based on a synergistic combination of moisturising and emollient substances. The special formulation provides for excellent adhesion to the skin surface to ensure longer action. The permeable film created prevents deposits of contaminated particles onto the skin without affecting skin turnover. as an antibacterial gel for the skin generally. for “hot spots” on the body. around exit sites of external fixators where tissue integrity may be a concern. Salicylic Acid has keratolytic properties and acts by selectively breaking the keratinous protein chains present in the outer skin layer. It is well tolerated by the underlying cells. Apply the blue gel 2-3 times daily until the condition of the skin is improved and then reduce application to once weekly.